In our recent music video, we asked meeting professionals to predict what the industry will be like 25 years from now. Contest has ended. Check back for future contests! The winner was Elizabeth Reeves of the Investment Company Institute, who won the grand prize – a trip for two to Cancun, courtesy of the award winning Five Diamond JW Marriott Cancun and United Airlines. 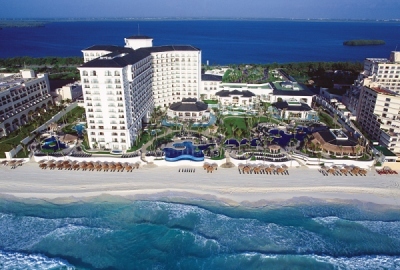 It included three nights lodging at the JW Marriott Cancun Resort & Spa with resort credits, plus complimentary round trip airfare for two, courtesy of United Airlines. Many meeting professionals sent in great ideas, but here are the finalists - as voted on by you! Online spec submissions will make submitting function sheets full of food orders, room sets and AV orders a thing of the past!! Venues will have online forms with option drop down menus for each meeting detail. For instance, you will be able to select a room name, click "hollow square" then select the number of seats in the same form. Capacities and floor plans will be readily accessible on the same page. Under an F&B tab, all of the hotel's menus will be available as options and it's as easy as selecting one then selecting your headcount from a dropdown box. An AV tab will let you click the type of mics you need, size of screens, etc. No more long, tedious Word documents!! It is quicker, saved online for use from year to year, and has the added benefit of being green! In 25 years, meeting planners will have access to an all-inclusive, all languages database that houses information about every single unique meeting venue in the world. We will be able to know within nano-seconds the availability, rates, competitors, menus, guest room rates, tax, local customs, function space and layout diagrams down to the millimeter, transportation, weather, geographic positioning and maps, of our meeting venues. Any question meeting professionals may have about a venue and location-- even down to does this venue offer complimentary massages to the meeting planner as a thank-you gift -- will be searchable. And don't think that this information will be at your fingertips -- in 2036, we won't have iPads anymore, we'll have computer chips imbedded within us that we just simply have to think of our venue wants and desires and we'll have all of our answers given to us instantly. This database will literally read our minds (I wonder if we can get a "significant other" version of this software!). ConventionPlanit.com, with your vision, you can make my database dreams can come true! Everything will be done electronically on one system, planners, hotels, setup guys, speakers, attendees etc... You will be able to plan a meeting from start to finish using on integrated system. From RFPs to electronic site visits, to contract negotiations, contract signings, to marketing to attendees, to registration of attendees, to booking of rooms, to sending in specs for meetings, to uploading speakers presentations, to menu selections, to on site management, to bill review and reconciliation. It will all be done on line and electronically. Plus in 25 years, everyone will have a hand held computer which projects what you are working on to anywhere you wish on a wall, in the air, on a screen or just to your TV. The Great Robsultar Look into my crystal ball what do you see? I see meetings in the year 2036 will be conducted pretty much as they are now with a few exceptions. With the internet and other virtual technology at our finger tips the need to bring the personality back to our meetings is much needed. I predict that submitting an RFP will be done via laser projection, decisions made quicker and site visits done via interactive virtual tour. I believe that even technology won’t totally replace the need for human contact and interaction. We may have body doubles or robots clones that can travel walking, running, swimming long distances eliminating the need for the planners having to always leave the office to conduct business with our partners. I predict that American is going to catch onto the teleworking bandwagon; which will cut down on our carbon footprints and help to heal the world. I predict that we old planners will still be around :) Planners don’t go away they get better with time!